Events are 'things which happen' on your palm, not necessarily triggered directly by yourself. With Apt you can define actions to take place automatically as a response to those events. Triggers before the target is launched. Note that there are no controls on the screen at this point. Triggers after the target has launched, and is waiting for input. Important: do not use this trigger to go to another app, do something and come back, otherwise you'll hit an infinite loop. Use -Launch for that purpose. Triggers when the target is about to exit. There are still controls on the screen when this trigger executes. When you leave an app via an Apt launch (e.g. from a button trigger) , if there is an Exit trigger defined the macro will end at the first launch action and the Exit macro begin. However, after the Exit macro the launch action will take place to take you wherever you wanted to go. Triggers when the form with the ID x is about to open (it hasn't been drawn yet…). If x is 0 any form opening is matched. Triggers when the form with title x has finished loading. If x is blank, matches any loaded form. Does not catch forms with no title. Triggers when the form with title x has exited (controls are no longer available). If x is blank, matches any exited from. Does not catch forms with no title. Triggers after a Hotsync operation is complete. actions to be performed when the device has finished a soft reset. Currently this trigger is only respected for the *Default* target. Triggers when there has been no pen/button input for the specified number of seconds. Triggers once as above then stops. When input is received after it has triggers, the timer is reset and it can trigger again. Triggers again and again after the specified idle time. In the screenshot above, every 8 seconds the screen brightness is reduced by 20. When some input is received after the device has been idle for the specified number of seconds. Warning: do not perform any complicated actions here if you also have an Apt trigger associated with the input event (e.g. a keypress). If you are using in association with Idle actions, to restore something, it's recommended you put the Input time at least 1 second less than on the Idle trigger. Triggers when an expansion card has been inserted in the device with the specified name. A blank name matches all names. 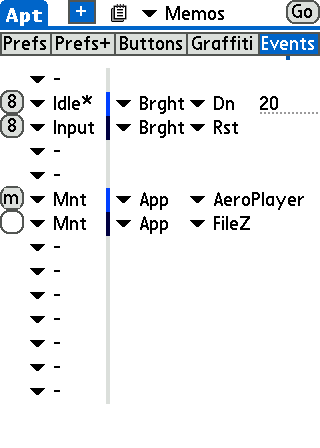 In the example above, aeroplayer is launched when the card labelled 'music' is inserted, when any other card is inserted FileZ is launched. Triggers when any expansion card has been removed from the device. The device has just woken up (powered on). Note, that this may not be due to someone pressing the power button. For instance, you may have alarms scheduled to do something in the middle of the night. The command bar is about to come up. The command bar has just disappeared. The control with resource ID x has just been selected (or pressed, dependent on the control). Actions will take place before the control's normal action (but some actions e.g. app launches will take place after). The menu item with resource ID x has just been selected. Actions will take place before the menu item's normal action (but some actions e.g. app launches will take place after). Triggers every day when the time is as specified. Does not wake up the palm. If a Time trigger is in *Defaults* it will always take effect. If it is in a target profile, it will only take effect if the palm is in that app when the time reaches HHMM. Triggers at MM minutes past every hour. Triggers when a peripheral is connected. x should be 'u' (USB), 's' (SERIAL) 'p' (POWER), 'o' (OTHER) or blank for all. Triggers when a peripheral is disconnected. x has same significance as above. Triggers when a network connection is made, initiated by the app with the specified creator ID (4 letters). If x is not specified, triggers for any connection. As above, but for network disconnects.